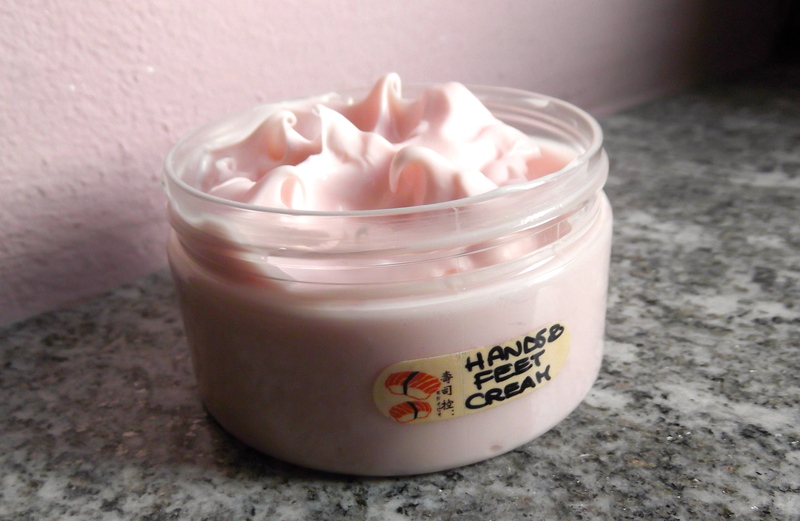 How to make foot & hand cream: formulating! Imagine we want to make a foot or hand cream: we know that it has to be rich in fats (around 20-25%) and it doesn’t need too many active ingredients or at least not the most expensive: a cream for foot and hands needs to be thick, very emollient and hydrating. Nothing to say about the phase A: except for the explanation of the choice of the gelling agent. Here about the fats we know we can use even up to 25%, we don’t have problems about fatty acids and the only thing which can stop us from choosing merely out of our taste is to always remember about the GREASE-FALL rule. Just to sum it up: in the formulation of one cream you need to add butters and oils of different consistency. According to the result you want to obtain, you will try to create a gaussian wave distribution of oils and butter %: for example if you want a thick cream you will use the higher percentage of butters (but not only them!) and if you want a light cream you will use very light density oils mostly (but also a very low percentage of butter). I never talked about waxes before, so I do it now: waxes are usually not counted into the grease-fall as their function is mostly to add a very thick and heavy feeling (but also quite dry) to the cream. However they give a good protection to the skin, creating almost a film, therefore it is a good idea to add them in our cream since feet and hands (specially in cold winters) need protection against the cold. As you can see every consistency of fat is added to the cream, giving more importance (read “more percentage”) to the butter which has to give the consistency to the cream. 25% fats (remember we don’t count the waxes)This just to say that once you have the grip of it you can variate very much in your formulation; however having more ingredients in number doesn’t mean having a better grease-fall or having a better cream in the end. – gloconolactone – 2 This ingredient is an acid which, if used at 4-5%, is an exfoliant, while, if used at 2%, it has mainly a sequestrating-function (I copy pasted from a chemistry dictionary online: sequestrating is the action of forming a chelate or other stable compound with an ion, atom, or molecule so that it’s no longer available for reactions) to make it simple it means that it keeps the pH stable, therefore if you add urea in your cream, always remember to add 2% of gluconolactone. I weighted the ingredients of Phase A in this order: glycering, xanthan gum, water (keeping 15 gr of water aside for the Phase C). I weighted the ingredients of Phase B and added them in the second becher. I put both of the bechers in a double-boiler and checked that they reached 70°C. Once reached this temperature I poured Phase B into Phase A in 3 different times, mixing with an immersion-mixer until everything looked smooth, emulsified and white. At this point I kept stirring slowly with a spatula until the cream reached room temperature. I weighted the Phase C and added to the 15 gr of water which I had set aside: first the urea, then the gluconolactone. I added this mixture to the cream. Then I added the preservative and mixed with the immersion-mixer once again (the final time: it will give a better result in the cream). I like the idea of making my own hand and foot cream with nice scented oils such as argan oil. I think urea is both a preservative and a way to smooth and lightly slough skin so it is a good addition to the homemade cream. My son is a physiologist and I’ve visited him in several labs. I love your efforts here but can’t understand ANYTHING! For example, a Web & Amazon search to buy “gloconolactone” comes up with ZERO! And how the heck do I check the pH??? With those diabetic strips from the drugstore? I want to make a strong urea cream for heavily calloused feet. I’d LOVE a simple recipe! You obviously know what you’re doing and your cream looks beautiful! Simple recipe doesn’t mean effective. To formulate with Urea there must be gluconolactone (or something that works similarly) to not let the pH rise so it is a must. pH stripes you can buy online together with gluconolactone. On my blog you find all the theory of making creams and also links to serious online stores. Just check the All recipes site index and you will find all the links there. It sounds difficult and overwhelming but it is not. Yes it takes some time to learn but it is worth ig. I believe the cream was not well emulsified, therefore after a month the oils separated again. Thank you for this introduction to making creams! I found it refreshingly technical with lots of helpful insights. I will be giving it a try after delving deeper into your website. Fun! Always love experts who know how to explain to laymen. Thanks for that! I want to add Urea to my cream. Can I use lactic acid( which I have at hand) to reduce the ph instead of gluconolactone? If so wat must be the ratio? Thank you. Lactic Acid lowers the pH, yes, but that’s a temporary thing: we use it to lower the pH of our creams but in the moment we make them. We make a cream, we check the pH, if it needs to be lowered then we add few drops of lactic acid… wait 5 minutes and check the pH again until we are satisfied. The problem is that Urea tends to rise the pH in time, which means that if we made a cream pH 5 and waited few weeks, if we were to check the pH again it could be 6 (or higher). Urea changes at higher pH so we need to keep the pH of our cream stable… so this is the reason why we add Gluconolactone! In fact it works in a way that it actually stops the pH from rising in the cream (thing which lactic acid cannot do). You see, Gluconolactone creates a system which stabilizes the pH (to make it very very simple: Gluconolactone “tends to stop” the pH from rising”); in fact if you, for example, added too much gluconolactone and got a very low pH and wanted to rise it… it would take you a LOT of alkaline substance to make the pH rise again. So this is why it cannot be substituted with Lactic acid. I dont have access to gluconotlactone since the few sites that offer this dont ship to India where I live.I googled for other sequestrating agents like you mentioned. Citric acid came up.I have some at hand Can I use this instead? Actually I wanted to make a DIY Amlactin with the ammonium lactate.will it work If I I add 12% lactic acid and about 10% Urea and a sequestrating agent additionally to adjust the ph. Or will this change the compound itself? No citric acid is again like lactic acid. Sodium lactate is a good hydrating agent. But what kind of cream do you want to achieve? If it is for feet or hands (as it should be) you could adjust the pH and keep it adjusted (every week you check it). You can make a very small amount (200 gr) and use it quickly so the Urea won’t go bad. Thank you so much for the quick response. I want to make a body cream/lotion that would take care of hyperpigmentation left from psoriasis that I used to have. I cant use strong AHAs as it may irritate my skin and trigger a flare up. Amlactin is a safe mild exfoliant and moisturiser that works well in my case. But again its not available where I live. 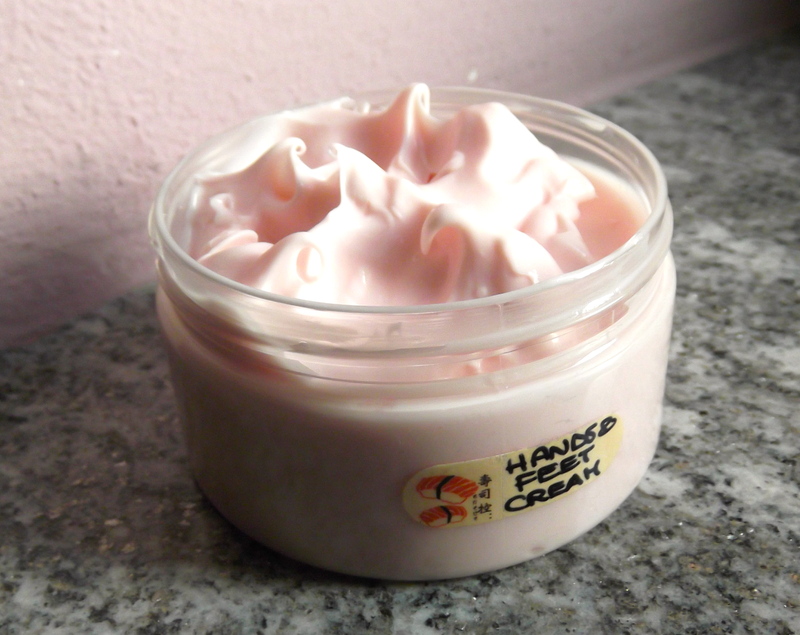 I put together this recipe with the ingredients I have at hand using your hand cream as a model. Can you please troubleshoot this for me? Make it the way you described above. Ph at 6. Im not really worried about the consistency of the lotion/cream as Im only going to wear it at night. And Im okay with making a fresh batch every week. It would be great if the actives compliment each other and work to reduce the spots and keeps skin well hydrated.Will this work? N acetyl Glucosamine 3 – I never used this ingredient so I don’t know it and I don’t know if the concentration or the pH is ok.
Licorice extract 8 – if it is a powder (what kind of extract is it?) 8 might be too high (the cream might separate because when a cream is too full of powders it tends to not emulsify very well). I will think about it but most things you have mentioned are only hyped in Spas but they are nothing special. I mean: cuticle removing balm 🙂 it is a simple thick cream or thick fats combination with a good smell. The same goes for hand feet and all the other treatments. They just ask if you would like the pampering vitamin E treatment or the new Hyaluronic Acid treatment and they charge you a lot… but both those creams have probably less good ingredients than you put at home. and wat bout feet callus? I love your very easy to follow formulation. The cream came out thick and smooth. Is it possible to add (phase c)urea, gluconolactone and a preservative to a ready made hand cream purchased at the store? Hi , thank you very much for your kind sharing. I have a question on emulsifier. May I know how would we identify what and how much emulsifier to be used in a cream? can you suggest me the substitue for urea in hand creams? Hmmm urea is extremely cheap and works so well that I don’t know what could be a good substitute. Exactly what do you want your hand cream to do? Because urea does a bunch of things, so I can think of something more specific. Hello, I have found gluconolactone but it come with sodium benzoate and calcium gluconate . Can I still use it? Hello!! Loved your recipe and your website. I’m from Brazil and I’m having trouble finding the gluconolacctone in here. I will try to do as you suggested above, a small batch and then checking the pH weekly. Thanks! !